I have been a fan of Tammy Wynette’s since I was 17 years old if not before that even. For some reason every song I would hear her singing always had some connection to something going on in my life, or at least I liked to think it did. Tammy Wynette was born in Itawamba County, Mississippi as Virginia Wynette Pugh. She was in her late teens when she got married and worked in a bar as a barmaid and she sang in Memphis. In 1965 she suddenly was divorced and had three kids and was living in government housing in Birmingham, Alabama. She sang on a local TV show from 6 to 8 am and then worked in a hair salon until 7 pm every day. She moved to Nashville the following year and started her musical partnership with producer Billy Sherrill. It was because of Billy that she got her name Tammy. She use to wear her blonde hair in a ponytail like Debbie Reynolds did in the movie, Tammy. This DVD is a fine collection of all her hits starting with the beginning of her career. She starts out with one of Loretta Lynn’s songs called Don’t Come Home a Drinkin’ (With Lovin’ On Your Mind). Tammy was only 24 during this performance in 1967.She goes on to sing Your Good Girl’s Gonna Go Bad and I Don’t Wanna Play House. Of course any special covering Tammy Wynette’s hits would have to cover her singing her famous D-I-V-O-R-C-E and Stand By Your Man. She performs several other hits along with a few duets with George Jones. I had the pleasure of attending one of Tammy Wynette’s concerts at the Magic Casino in Bay St. Louis, Mississippi a year or so before she died and I have to say I really enjoyed it. When she died in April, 1998 the world lost a great performer. She died of a blood clot at the age of 55. 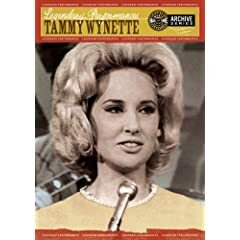 If you are a fan of Tammy Wynette’s then I would recommend this DVD. It will bring you back in time. IÂ know I sure enjoyed it. You can buy this at Amazon. No user commented in " DVD Review: Legendary Performances: Tammy Wynette "